Over the past four months we’ve talked with many groups who are strong supporters of our mission: to promote the responsible production and use of print on paper, including its sustainable features. Many of these organizations have joined Two Sides and are helping us spread our network in the U.S., and educate more people on the environmental, social and economic benefits of print and paper. We look forward to developing close working relationships with all these groups, and hopefully many more. President & COO, Two Sides U.S.
“Greening” laptops by making them out of paper. Some people get it! Paper laptop outer casing design by Je Sung Park. From Yanko Design website. Amidst the numerous anti-paper and print messages like “Go paperless – save a tree” from companies encouraging us to choose the digital options (ex: e-billing), it is refreshing to see that some organizations understand the unique environmental features of paper. They understand the fact that paper comes from a renewable resource that can be sustainably managed, and they get the fact that it is highly recyclable and recycled unlike many other materials we use today to manufacture the hundreds of millions of electronic gadgets we use (i.e. metals, plastics, fossil fuels, etc…). In other words, paper has unique features that categorize it as a long-term sustainable material, as long as it is produced and used responsibly (as all products should). It pleases me even more when the people that “get it” are servicing the electronics industry itself! 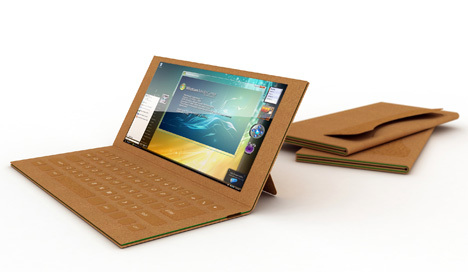 Yes, they are starting to make laptops out of paper, and marketing them as “green”. I should also mention the growing wood-plastic composite market, where wood fiber is being blended with plastics to make the final product more recyclable and more renewable. These materials are considered by some to be a more sustainable alternative to conventional plastics. Some companies, such as UPM-Kymmene, are also marketing the lower carbon footprint advantage of these composite products. So it seems that the environmental features of wood fiber, pulp and paper are gradually being recognized as an effective method to make products more renewable, more recyclable and with a lower carbon footprint. Perhaps even more so if these materials are sourced responsibly and come from well managed North American forests.